Few matters more powerfully prove the crisis of modern conservatism than the attack against the Koch brothers by President Trump, who calls them "a total joke." As a Kennedy Democrat, my view is that when Trump clashes with the Koch brothers, the world is a better place. That's because the world more clearly sees the hypocrisy and phoniness that currently corrupts the great philosophy once known as conservatism. One of the reasons I have repeatedly praised George Will, the conservative columnist at the Washington Post, is that he has stood up with clarity and conscience against the collapse of modern conservatism created by the politically reactionary and morally corrupt presidency of Trump. That is why I offered high praise to former President George W. Bush, no matter how much I disagreed with him throughout his career, for his sweeping and cogent criticism of the Trump presidency. That is also why I offered high praise to principled voices such as Joe Scarborough, Max Boot, Steve Schmidt and others who have spoken out, as Will has, with clarity and courage. True conservatism is an honorable philosophy with which I have almost always disagreed. True conservatism is an honorable philosophy that believes in free trade rather than trade wars, strong border enforcement but not tearing immigrant children away from their moms and dads and putting them in cages. True conservatism stands for reducing deficits rather than raising deficits to catastrophic and disastrous heights. Make no mistake, George Will disagrees with most of the views I hold, but he represents a true, honest and principled conservatism that Trump is determined to destroy while many "conservatives" march in lockstep behind him. The Koch brothers, by contrast with Trump, take certain positions that reflect an honorable conservative viewpoint. While I have supported a stronger trade policy than free-trade Republicans or Democrats, the Koch brothers are entirely right to oppose the reckless and radical trade wars that have defined the Trump presidency. Similarly, America desperately needs an enlightened bipartisan immigration policy, which Democratic leaders and the Koch brothers are entirely right to champion and Trump is radically wrong to attack. It is not surprising that the Koch brothers have come forth with criticism of certain wrongs of the Trump presidency. What is surprising is the degree that the authoritarian and intolerant Trump has chosen to personally and politically attack the Koch brothers. I have known for many years prominent people across the ideological landscape of American politics, from the left to the right, but I have never known one person from either party who has described the Koch brothers as a "total joke," as Trump now does. To many conservatives, the Koch brothers are heroes. To liberals, the Koch brothers are villains. That the Koch brothers would criticize Trump is a warning to conservatives. 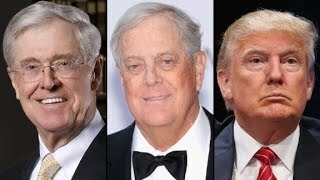 That Trump would attack the Koch brothers is a warning to Republicans.